NASA's Solar Dynamics Observatory snapped this X-ray photo of the Sun early in the morning of Sunday, August 1st. The dark arc near the top right edge of the image is a filament of plasma blasting off the surface - part of the coronal mass ejection. The bright region is an unassociated solar flare. When particles from the eruption reach Earth on the evening of August 3rd/4th, they may trigger a brilliant auroral display known as the Northern Lights. A solar flare from the sun this week poses no threat toastronauts on the International Space Station or plans for vital spacewalkrepairs on the orbiting lab, NASA officials say. But those particles only created stunning aurora displaysas they interacted with Earth's magnetic field. They posed no radiation threatto the six astronauts living aboard the space station, or their weekendspacewalk to begin replacing a faulty cooling system pump. "There has been some solar activity in the last fewdays and the teams have been watching that closely," NASA spokespersonKyle Herring said Wednesday during mission commentary. "There appear to beno effects with relation to radiation associated with the solar flare during theupcoming spacewalk." Saturday's spacewalk will send NASA astronauts DouglasWheelock and Tracy Caldwell Dyson outside the International Space Station inspacesuits to begin repairing the outpost's cooling system. An ammonia pumpfailed on July 31, knocking out half of the space station's U.S. cooling systemand forcing astronauts to shut down many systems and leave others withoutbackups to keep the space station overheating. The Aug. 1 sun eruption, while powerful, stemmed from aClass C3 solar flare and began striking Earth's magnetic field on Tuesday. Itwas not strong enough to do more than create bright auroras and spark a stronggeomagnetic storm in Earth's magnetic field that lasted about 12 hours, NASAofficials have said. 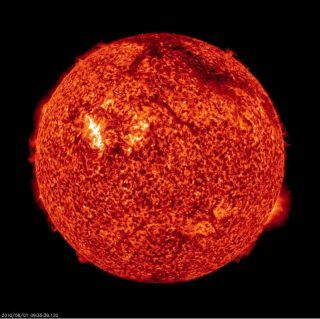 If a solar flare or eruption is strong enough, astronautscan seek shelter in a more shielded part of the International Space Station towait out the sun storm, NASA spokesperson William Jeffs told SPACE.com. Thatwasn't the case for this week's solar weather events. "There was no need to relocate the ISS crew duringthis recent event," Jeffs said in an e-mail. Space radiationis a chief concern for astronauts in space because large doses can damage humantissue and cause sickness, increase susceptibility to cancer or ? in extremecases ? lead to death.? The risk near Earth, however, is limited. Astronauts inlow-Earth orbit do not receive the full brunt of space radiation because the spacestation flies within Earth's protective magnetic field, which extends fartherout. "Based on the NASA Space Radiation Program?sanalysis of events back to the 15th century, we estimate it would be almostimpossible for a solar storm to occur that would be so large to lead to arecommendation to evacuate the ISS," Jeffs said. Astronauts on a spacewalk, like the one planned forSaturday, can receive higher doses of space radiation, so they are timed toavoid high radiation events, NASA officials said. Radiation exposure is measured in milliSeiverts. On Earth,the average human receives a radiation dose of about 2 mSv a year frombackground radiation. One mSv of space radiation is about the equivalent ofreceiving three chest X-rays, according to a NASA description. Space station astronauts on six-month space missionstypically receive about 80 mSv of space radiation during solar maximum ? abouthalf the amount they receive when the sun's weather is at a solar minimum.? Jeffs said that most solar weather events tend to lead tolower space radiation exposure for astronauts because increased solar activitycan result in lower doses of galacticcosmic rays. Those stronger cosmic rays ? space radiation that doesnot come from the sun ? are a larger risk for station astronauts and futureexplorers to Mars or elsewhere beyond Earth orbit, he added. NASA will broadcast the International SpaceStation spacewalk repairs live from space on NASA TV, with the first spacewalkslated to begin Saturday at 7 a.m. EDT.